Anyway, the companion has been raving about this burger house eversince we got back together. He keeps on telling me that he wants us try it out being the big-eater that he is. So one afternoon, we went ahead and tried it out. 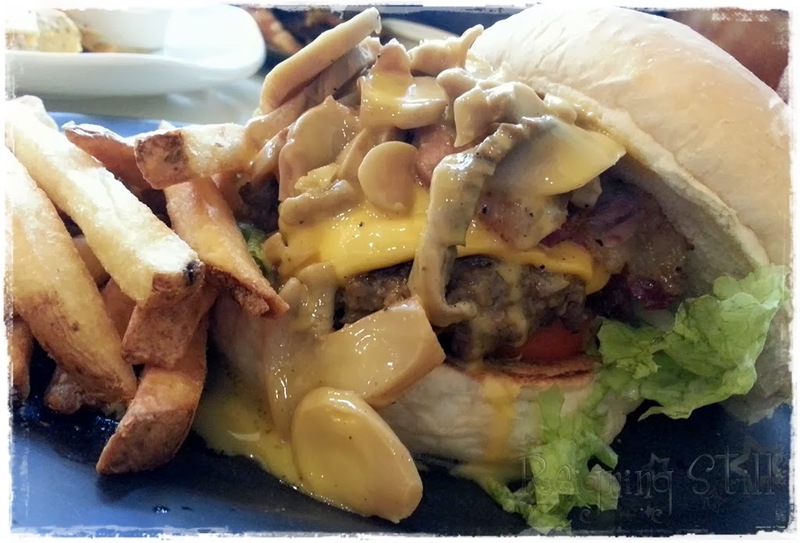 Zark’s Burger is located in Taft Avenue, Manila. In front of the De La Salle campus. The companion told me that it was quite famous and getting seats would be difficult. I was like, iHop at J.Co levels ganun?! I didn’t initially believe him, coz come on! It was just a burger house and it was a Sunday when we went there so no students. Getting a table would be a breeze! But boy I was wrong! We we’re on wait list when we arrived and had to wait like 30minutes before getting ourselves a table. Wow huh! In my mind, I was like, sikat nga ang lolo nyo!! It was actually a typical store. Nothing fancy. It' has that hole-in-a-wall vibe. They got tables and chairs scattered all over the place. No posh lighting, no nothing. I got the Zark’s Ultimate Burger. When I read on the menu that it was served with mushroom and bacon and cheese, I know I have to have this. It’s a quarter pound burger served with cheese, veggies, mushrooms and bacons. YUM! Actually it was oh so good! The veggies are crispy and fresh. The bacon was fried to perfection. I love that the cheese sauce and mushroom are not overpowering and just blends well with the juicy, yummy, huge burger patty. My only problem with this meal is that it’s soooo huge! I can’t fit it in my stomach. The thick and crispy fries that goes with it is perfect also. I was munching on it selfishly. All calories and cholesterol counting are thrown out of the window. May veggies naman. Baka pwede na yun! Char! The companion decided to get the most sinful and fattiest burger of them all. Deep fried burger? 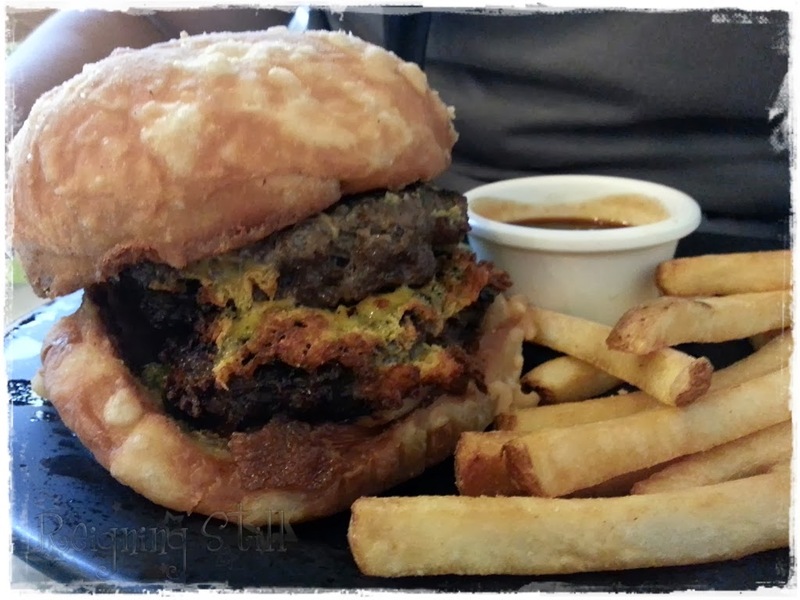 As if all the fats of a quarter pound burger is not enough, they have to deep fry it! Kaloka! And he got the 1/2 pound burger!! I was trying to talk him out of it but he still got the 1/2 pound. Kaya nya daw! Ayan! Busog na busog at halos di maubos ang burger. Akala ko hindi makakatayo after eh. Nyahahaha! Tried it and it was insanely good though. But I won’t dare finish an order. No no no! I also got a plate of Nachos Galore. It’s tortilla chips topped with cheese sauce, lemon garlic, bacon bits and tomato salsa on the side. IT.WAS.HEAVEN. And I was so shocked to see that they serve a plateful of nachos for Php 85.00! Nakakaloka sa dami! This is actually the yummiest nachos I’ve ever had. 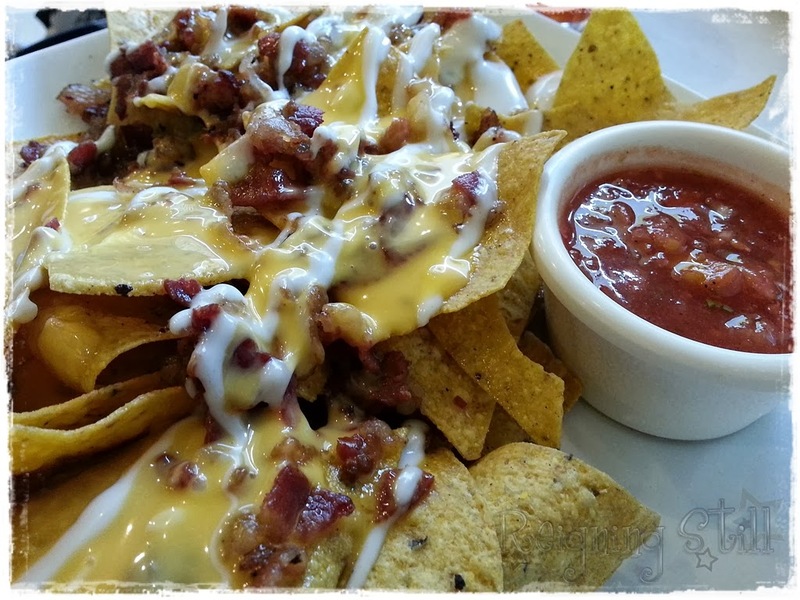 And I wanna go back to Zarks if only for the Nachos. Ganun sya kasarap. And the bacon bits are perfect. Ang sarap sarap!!! Overall dining experience was superb. Aside from the fact that you have to wait to get a table, which I think is worth it anyway, it was all good. The waiters are nice and friendly and very accommodating. They are relatively cheap because they got huge servings. And they serve sinfully great food. If you’re a health buff, hihimatayin ka talaga sa lugar na to. Pero sabi nga nila, masarap ang bawal! Char! Will I go back? Definitely! Maybe I’ll bring the siblings with me next time and just order nachos. Then, I’ll just get a bite or two off their burgers. Hmmm.. Sounds like a plan!